Do you hate the color, shape, size, or spacing of your teeth? Let’s dig into this a bit deeper…. Your smile should always be taken seriously – there’s no question about it! A new smile has the ability to truly change lives for people, which is why we enjoy helping our patients achieve that glorious feeling whenever possible. Smiling makes you feel good. However, some people have lost the ability to smile freely and even cover their mouths to avoid showing their teeth in public. 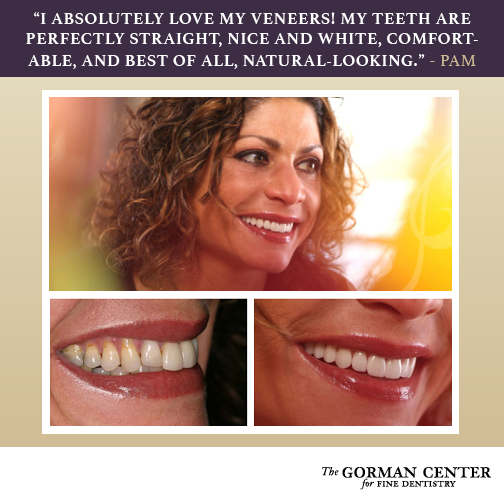 In many cases, the problems they are trying to hide — staining or discoloration, worn-down or slightly misaligned teeth, or too much space between their teeth — can be addressed beautifully with porcelain veneers! Wait, you’re telling me porcelain veneers can fix my teeth? “Veneer” means a very thin cover, making the surface of something look better. An extremely thin custom-made shell – that is astonishingly lifelike in appearance – is placed on the front of a tooth giving it a new “face.” To make veneers look naturally contoured and harmonious, it may be necessary to remove tooth structure, depending on the size of the teeth and your desired size and shape. Okay, Sooooo… How does this work? It really comes down to a 5-step process. Step 1: Planning for perfection. A smile makeover is a true collaboration — between the dental laboratory technician, you, and us. We all work together to help you become the best YOU! First, you’ll discuss with us what you wish to fix and what you want your smile to look like! We may create a life-size exact model and then using wax, add veneers to your teeth model. Another method may be to make trial veneers to place directly on your teeth. That way you can try it before you buy it! You will only have them on while in the office, but it will give you a good preview to help make your decision. Once we have agreed on a plan, your teeth will be prepared for the new veneers. Tooth preparation varies from polishing the teeth to removing tooth structure to allow room for placement of the veneers. Our overall the goal is to remove as little tooth structure as possible. After your teeth are prepared, an impression of them will be made. This will be the impression the dental lab techs use to replicate and construct your veneers. During the time they are being made (it can take a few weeks), you will be given provisional veneers. These will be cemented to your teeth to adapt to the new look and feel of your veneers. Once you have had time to adapt to the changes (often a week or two), we will invite you back to fine-tune the subtle details. We do this to ensure satisfaction with the final results! Once you are satisfied with the provisional veneers, we make another impression to send to the lab, this will finalize your look so they can finish crafting your new smile. After the veneers come back from the lab, they are bonded to your teeth. First, both your teeth and the inside of the veneers will be “etched” with a mild acidic solution. This etching process will open up tiny pores in both surfaces. Then, we apply cement to form microscopic tags that fit into these pores. Transforming Smiles, Changing Lives – How could you say no? St Paul Dentist, Dr. Steve Gorman not only can beautifully transform your teeth, but he can change your life. Call (651) 483-5134 today to ask about changing your smile for the better!